When you have a birthday right after Christmas, you may sometimes feel short-changed. But this year, David got a birthday splurge we will remember for a long time! 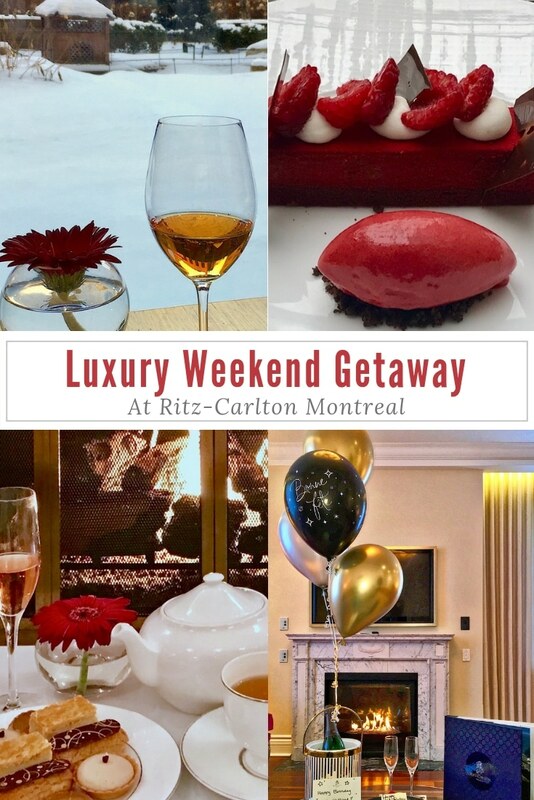 We headed away on a long 5 day weekend for a luxury getaway at Ritz-Carlton Montreal. Every part of our long weekend in Montreal was a pampering treat. When we arrived, we learned that the Ritz-Carlton Montreal was the first Ritz-Carlton in the world. We know that the Ritz-Carlton name comes with a gold standard of service excellence. And we were delighted to experience that gold standard throughout our entire stay. 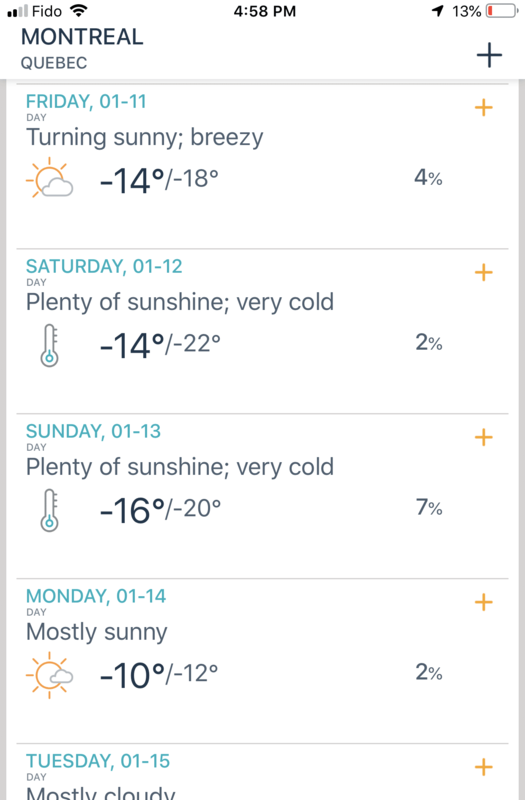 It was a frigid Montreal weekend, so we did not venture far for most of the weekend. 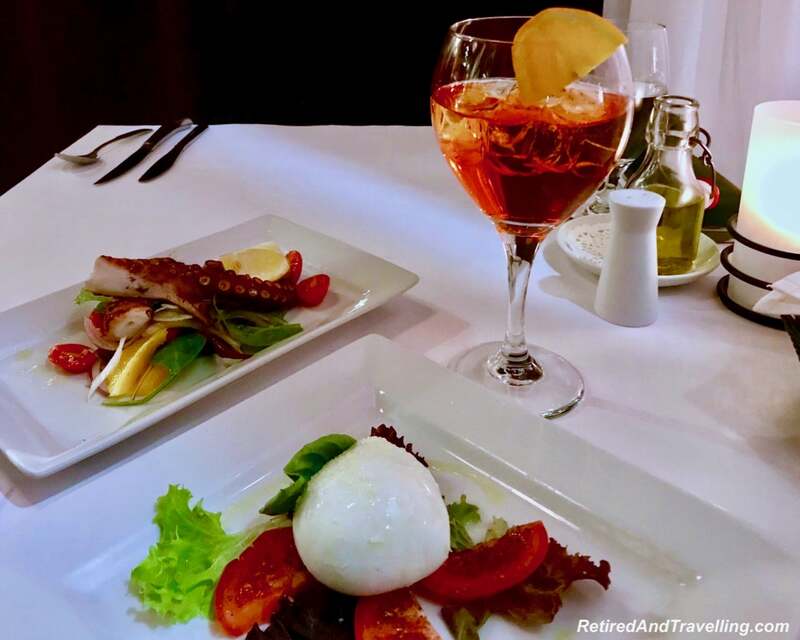 But we did find oh so many opportunities for great food and drink during our luxury getaway at Ritz-Carlton Montreal. The drive from Toronto to Montreal takes about the same time as taking the express Via Rail train. But in the winter, road conditions can make the drive much longer and more treacherous. We enjoyed our Business Class trip by train when we visited Ottawa in the summer. So it was an easy decision to book the train for our luxury getaway at Ritz-Carlton Montreal. The train left Toronto at 6:40 but got us into Montreal at lunch time. The trip home left just after lunch. So the timing was perfect to give us 5 days in Montreal to splurge. We were delighted with the renovated train car for our trip to Montreal. There was lots of room to work and spread out. 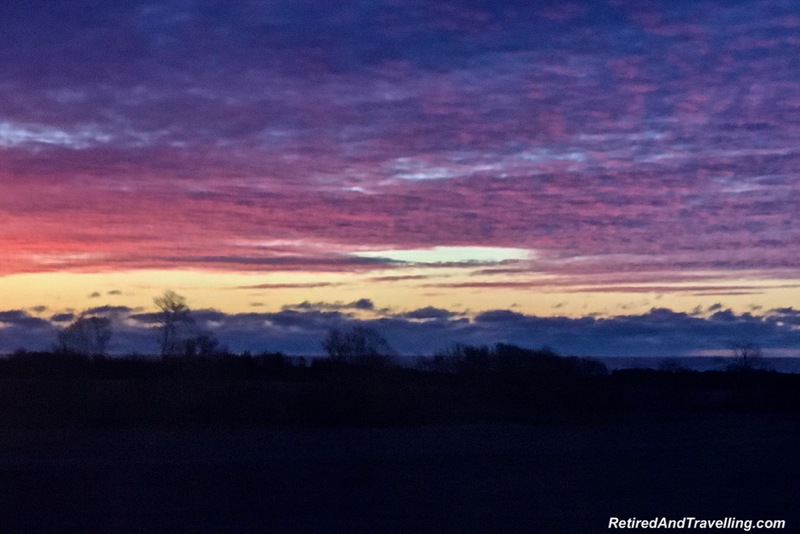 The sunrise added a great glow as we travelled. We were much less happy with the ancient train car we got on our way back home to Toronto. Cramped seats were almost worse than economy plane seats. The train rattled so much it was hard to work. And the tray was so small we were not sure where we would put a food tray. But the food was hot and plentiful. Dinner even came with several offers of alcoholic drinks. So all in all, we were glad we booked Business Class train tickets for our luxury getaway at Ritz-Carlton Montreal. The Ritz-Carlton Montreal customer service excellence started before we even left home. A phone call confirmed our wants and desires. And when we arrived, the awesome level of service continued. 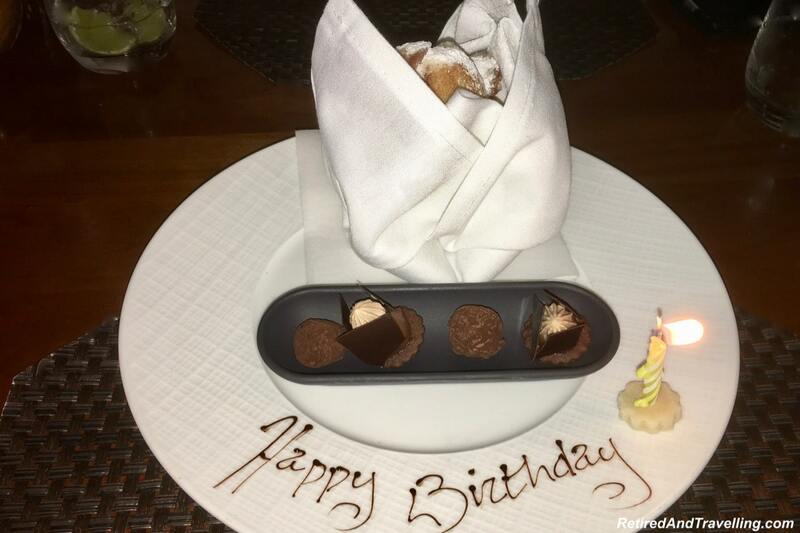 Our Marriott Rewards Platinum Premier Elite status typically gets us good room upgrades, but the team at Ritz-Carlton Montreal had an extra special treat waiting for David’s birthday. We were escorted to our room and found a lovely fireplace suite waiting. The fire was burning to welcome us. And the table in the living room was loaded with birthday balloons and the most decadent looking chocolate cake. Happy Birthday David! 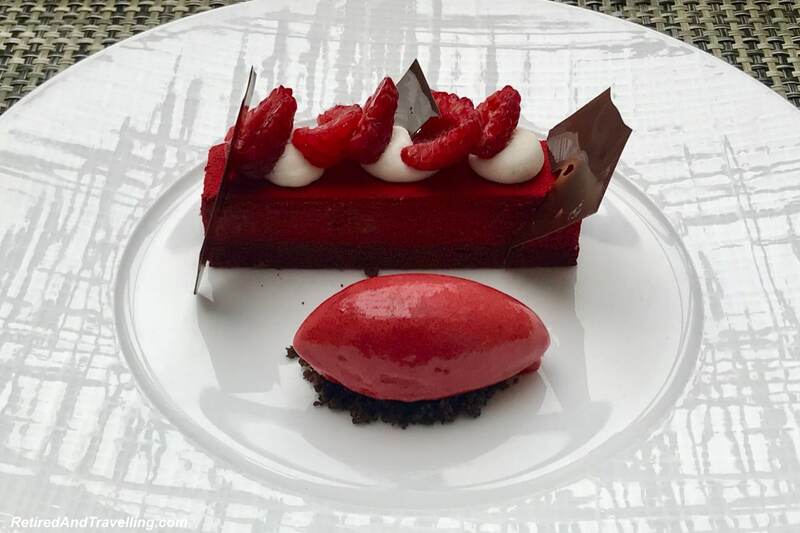 This was the first but not the last of the birthday treats we got during our stay at Ritz-Carlton Montreal. 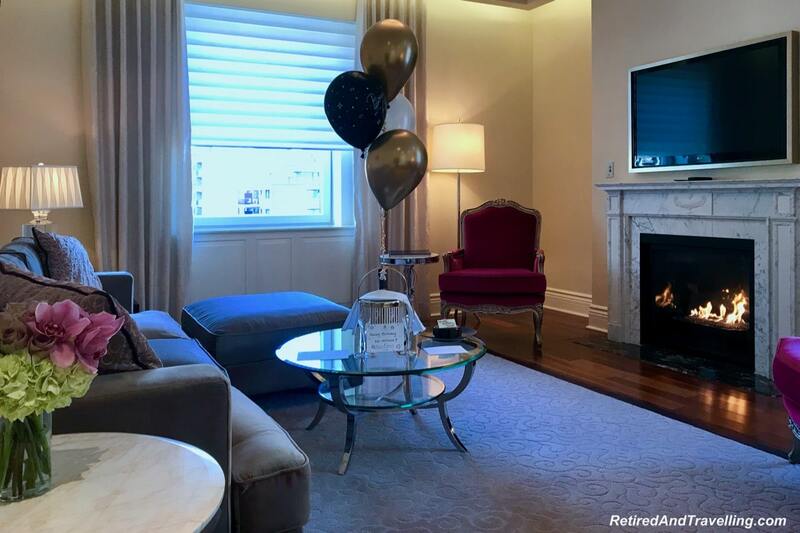 As we explored our suite and the lovely hotel, we saw the attention to detail that had been used during the recent hotel renovations. 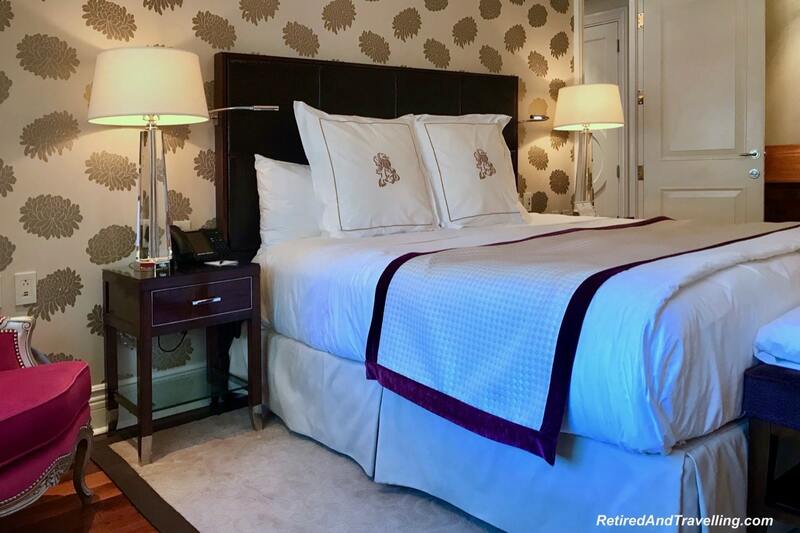 The hotel lived up to every expectation we had on our luxury getaway at Ritz-Carlton Montreal. The Ritz-Carlton Montreal is a wonderful hotel with so many things to keep you entertained during your stay. 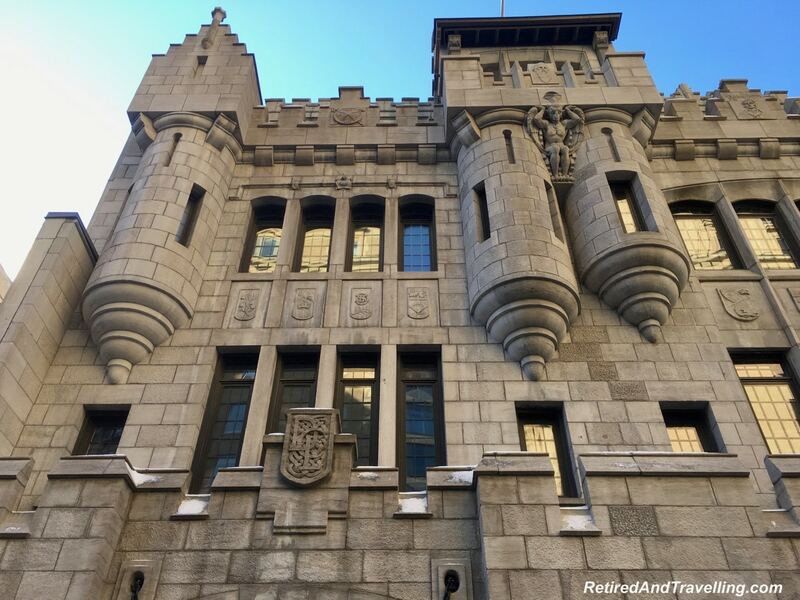 It was frigid cold in Montreal when we visited for our luxury getaway at Ritz-Carlton Montreal. But we were totally ok with enjoying the lovely hotel. Our wonderful fireplace suite gave us lots of space. But the front lounge area was also a great place to sit and relax. 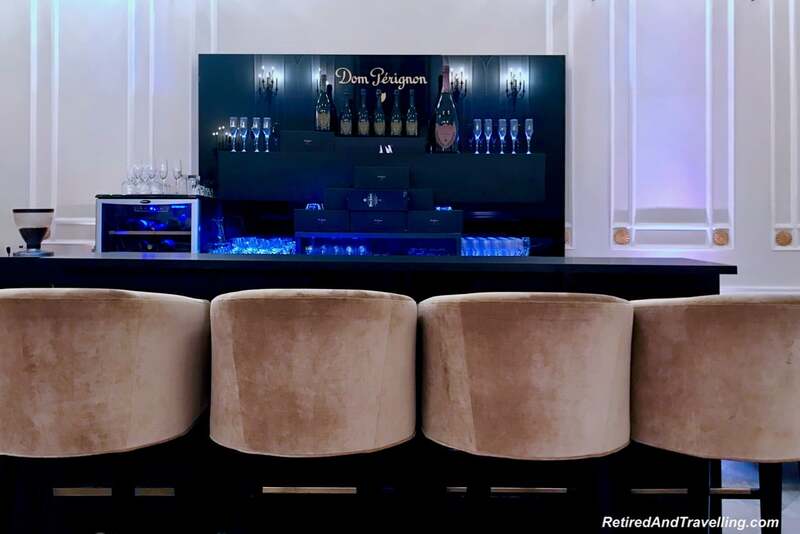 Or grab a drink from the Dom Perignon Bar! 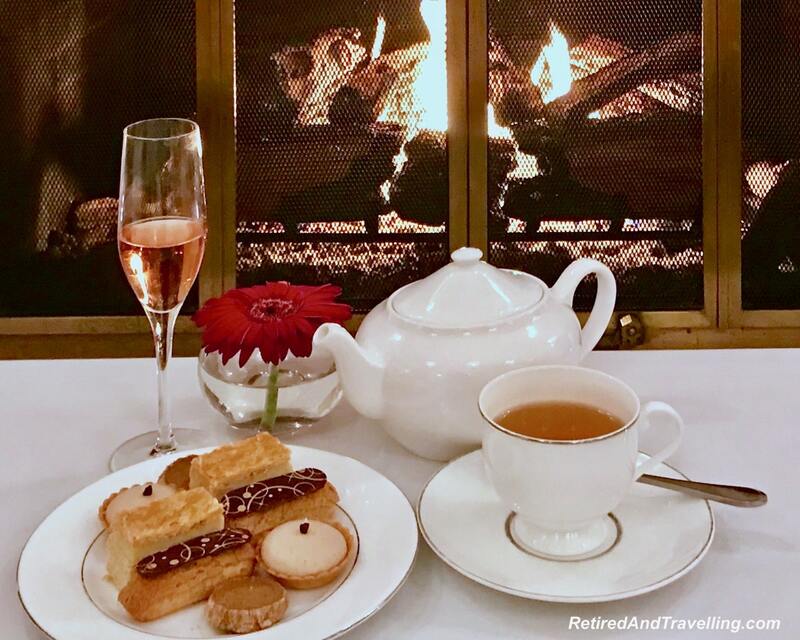 We certainly enjoyed the lounge for a splurge with afternoon tea at the Ritz-Carlton Montreal. There is a full service St. James Spa in the hotel. We really did plan on getting spa services on our visit. But we just ran out of time. However, we did spend some time at the rooftop salt water pool. 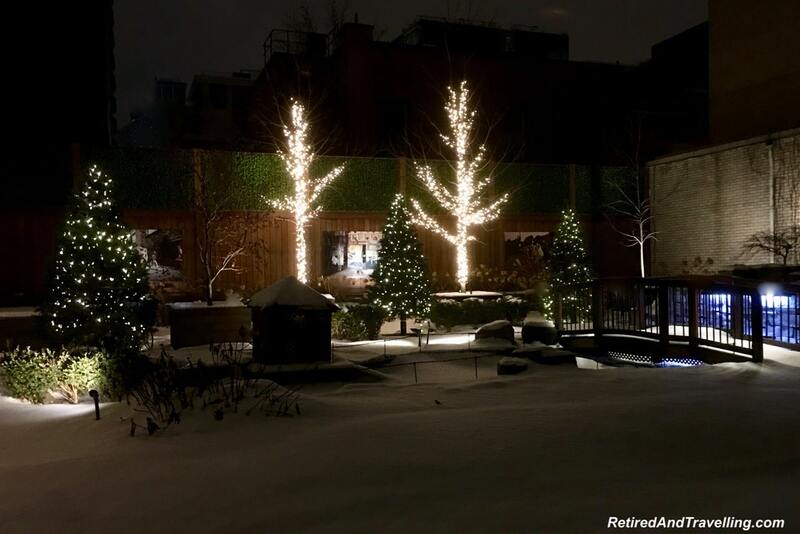 This oasis from the snow outside includes a large lap pool, lots of loungers and a fireplace too! On a luxury getaway at Ritz-Carlton Montreal you will find lots that will keep you in the hotel. 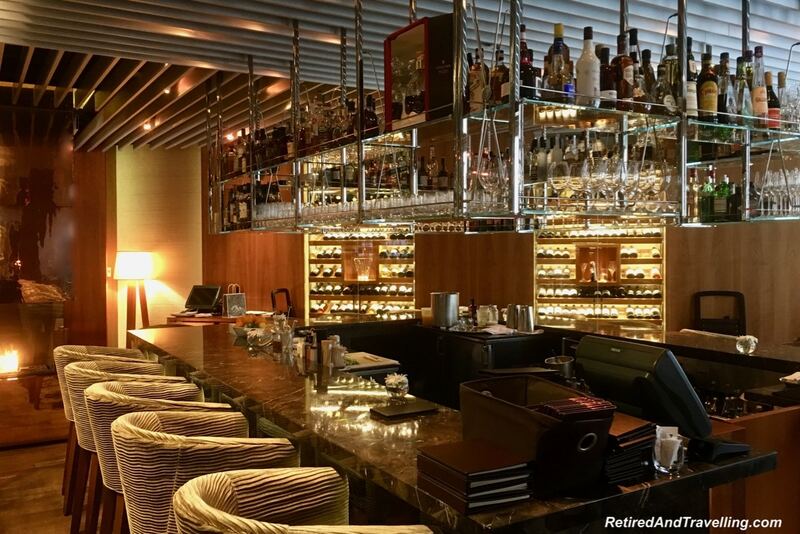 The Maison Boulud restaurant is chef Denis Boulud’s delight at the Ritz-Carlton Montreal. Assistant GM Philippe made sure that we ate our way through every possible meal at his restaurant. The buffet looked good. But we wanted some special treats off the menu. 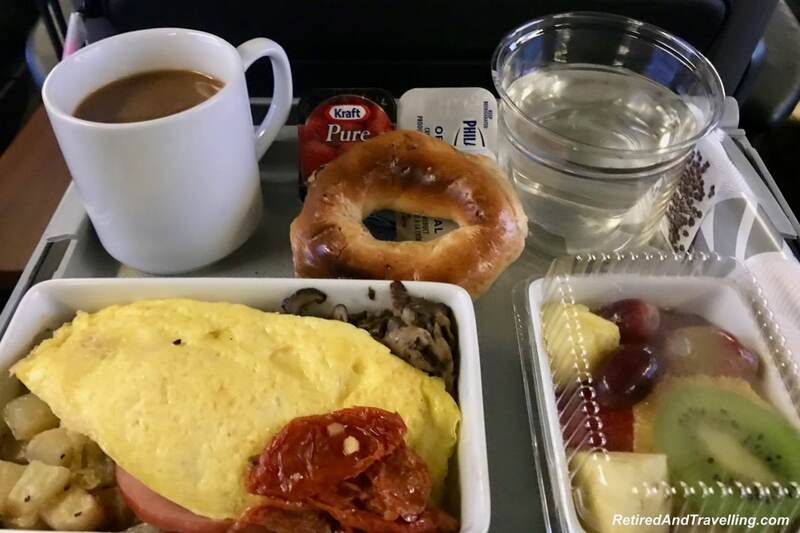 We started with breakfast one day and brunch on another day. 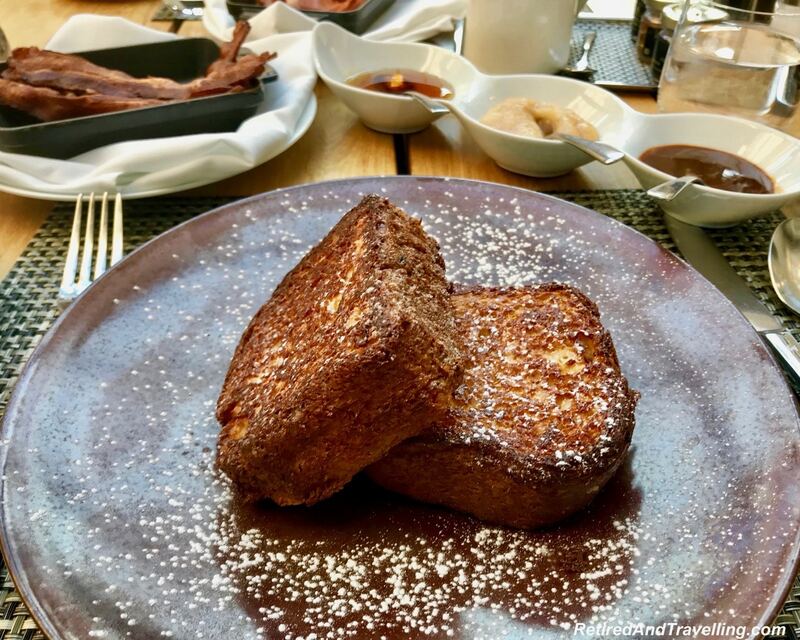 The french toast was light and crunchy. Made all the better when dipped in apple puree and salted caramel. 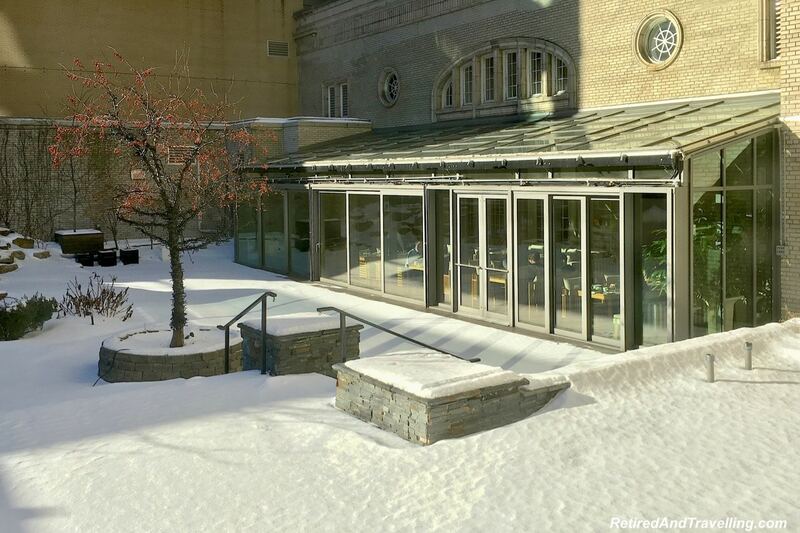 Lunch was served in the warm glass atrium with a view out to the duck pond buried in snow. Oxtail onion soup warmed us up. 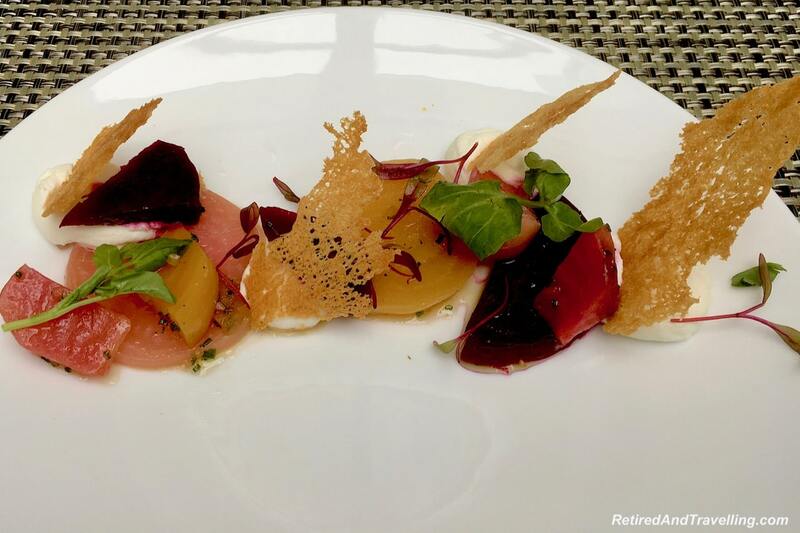 Beets and goat cheese was our nod to salad one day. 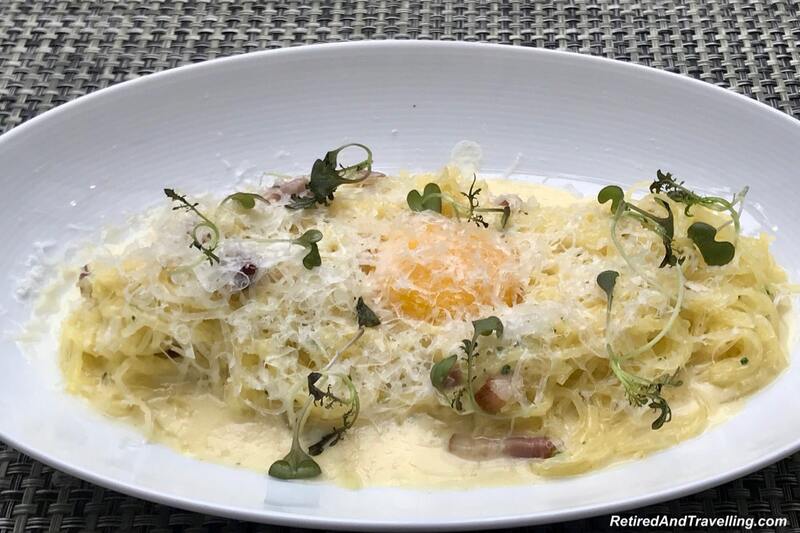 I loved the spaghetti squash carbonara so much that we had it twice. Coq au vin was a great treat. And the chocolate desserts were not passed up. The bar was the perfect spot to enjoy a drink or a more casual burger for dinner. The fire crackled and kept us warm on the snowy nights. It was day number four as we celebrated David’s birthday but he was still getting birthday treats. Chocolate truffles and a dish of the warm madeleines that we had become addicted to finished off our meal. I normally don’t like to perch at a bar. But these bar chairs were so comfortable that we headed back one night for a nightcap. 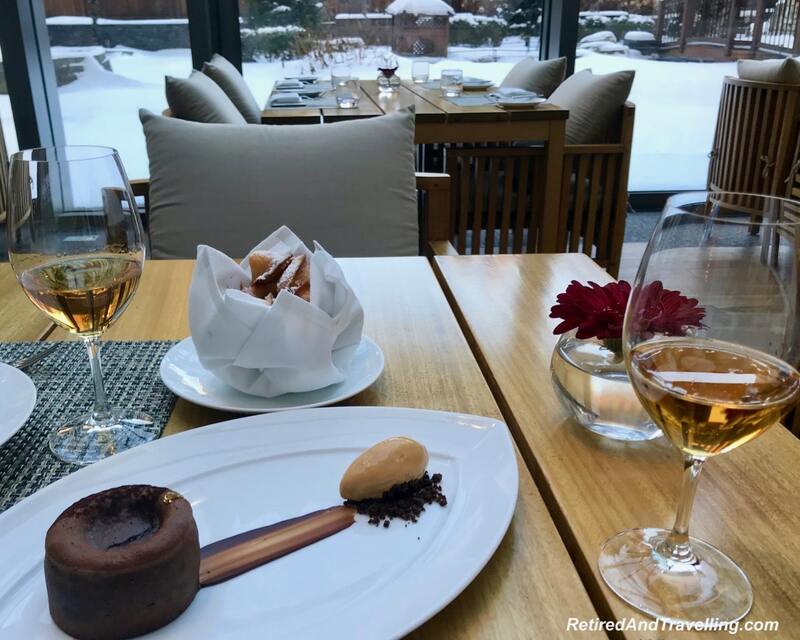 We had so much great food and drink at Maison Boulud on our luxury getaway at Ritz-Carlton Montreal. 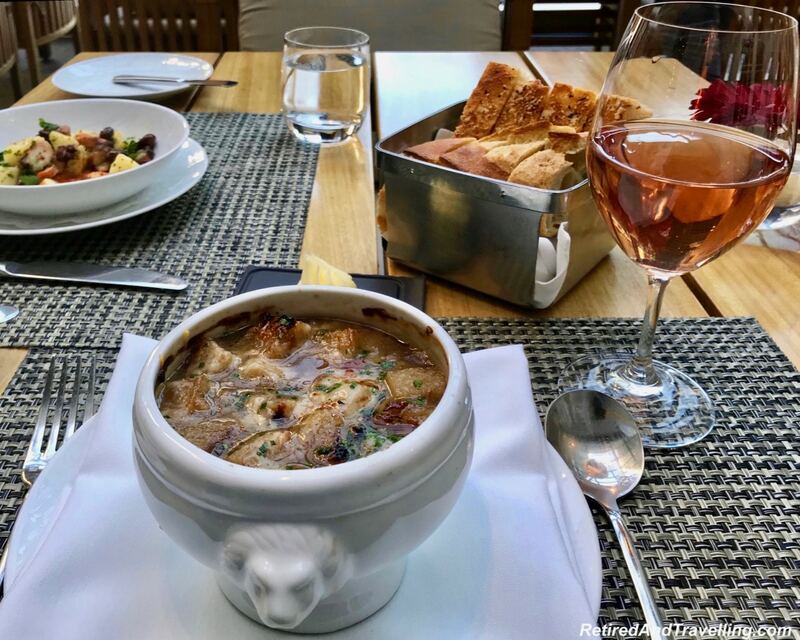 While we certainly could have eaten every meal at the Maison Boulud, we did occasionally venture out to try some of the culinary delights that Montreal is famous for. 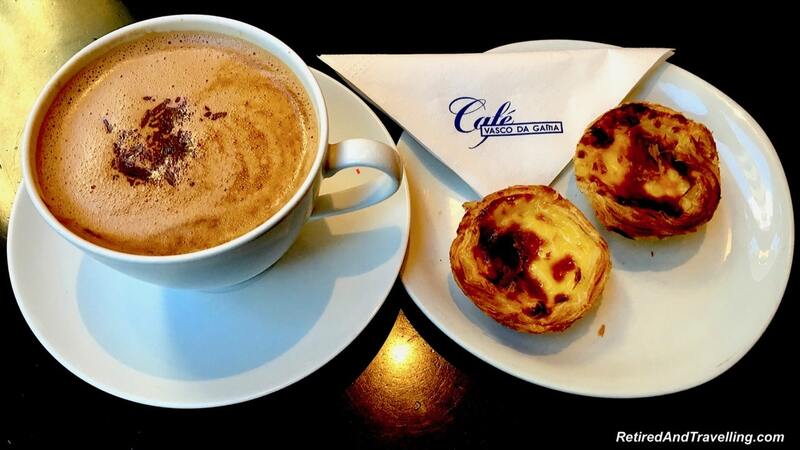 David found the Café Vasco Da Gama on one of his short walks out one morning. We were delighted to be able to enjoy the Portuguese tarts we became quite addicted to on our visit to Lisbon in Portugal. One night we ventured out for a more casual dinner at Alexandre’s Pub. Moules et frites (mussels and fries) were a speciality of the house. 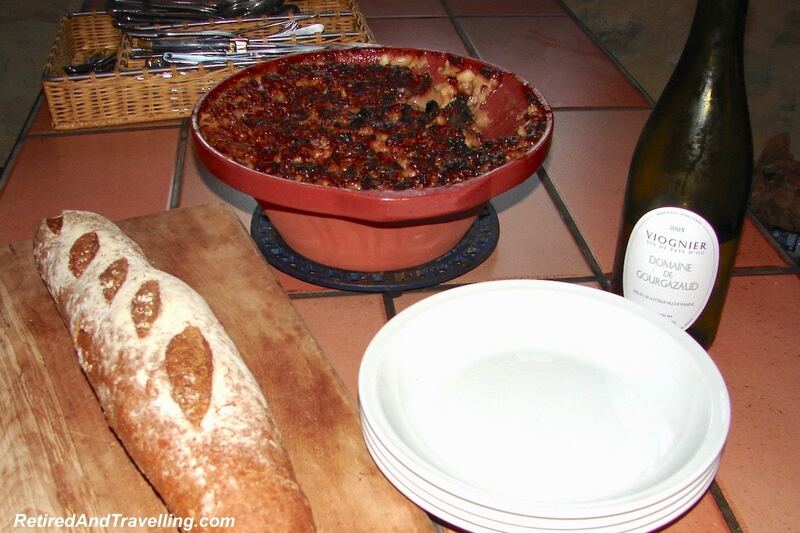 I re-lived my France experiences by ordering a cassoulet. The last time that David and I visited Montreal, we left with such great memories of perfect risotto. The hotel concierge searched to find us a repeat experience. 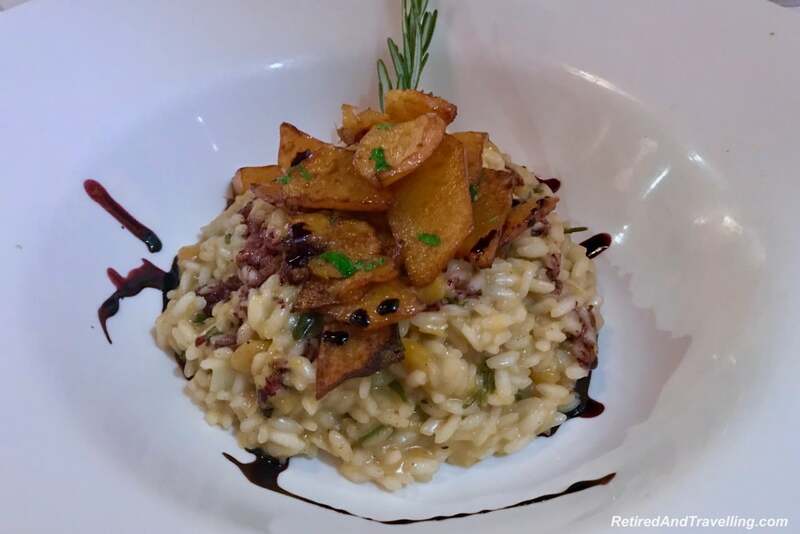 On our visit to Quattro, we got to try two different risotto dishes. One was made specially for me to bring back memories of risotto in Verona (pumpkin with an amaretto reduction base). But we left our decadent treat for the last day. 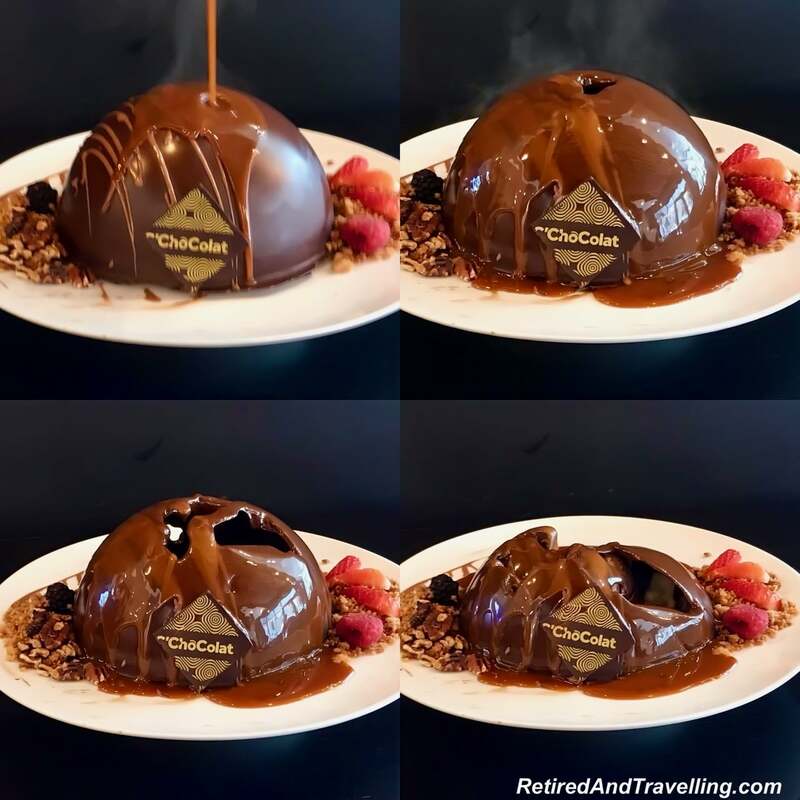 Cathy at RoarLoud Travel has been teasing us chocoholics with pictures and videos of the great chocolate desserts at C’ChoColat Lounge. We set up so we could capture every moment as the steaming hot caramel poured over the chocolate dome. And it melted down into a gooey delight. 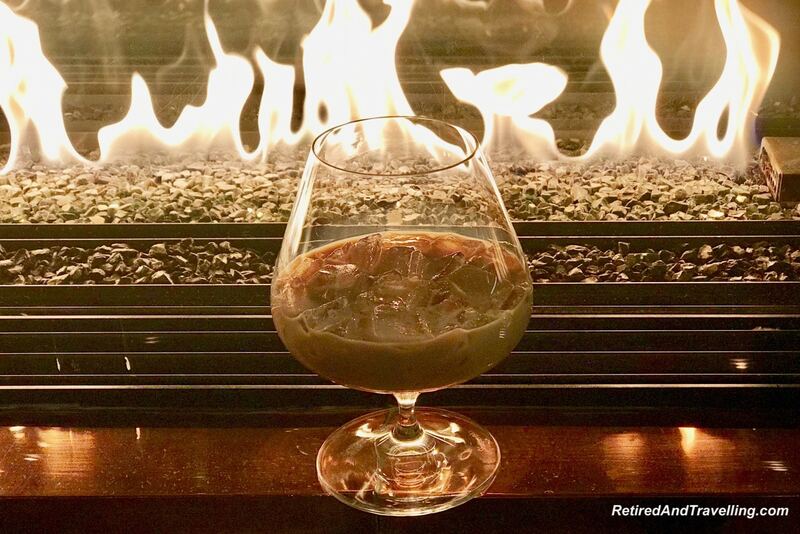 We certainly ate and drank our favourites on our luxury getaway at Ritz-Carlton Montreal. When we went to Quattro for dinner, we wandered a little when we were done. Notre Dame in Paris is one of our favourite spots to visit. 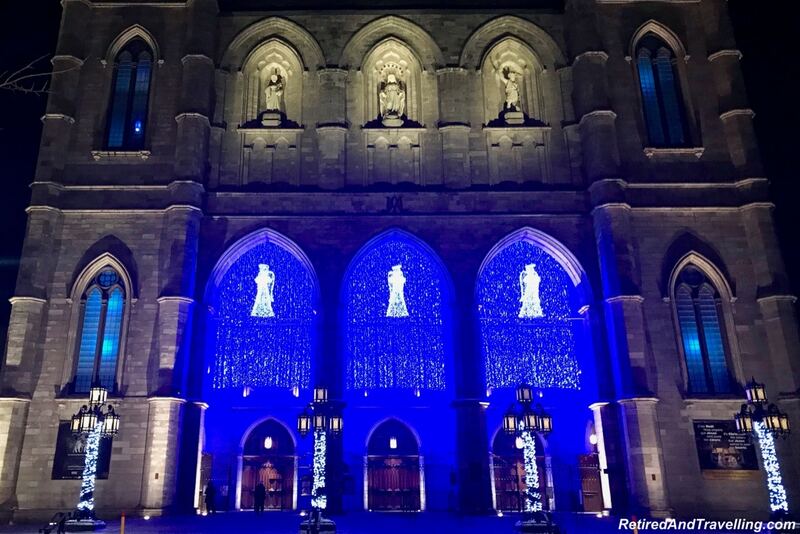 So it was great to see Notre Dame in Montreal all lit up with lights. We wished we had planned to visit inside to see the light show that was on. 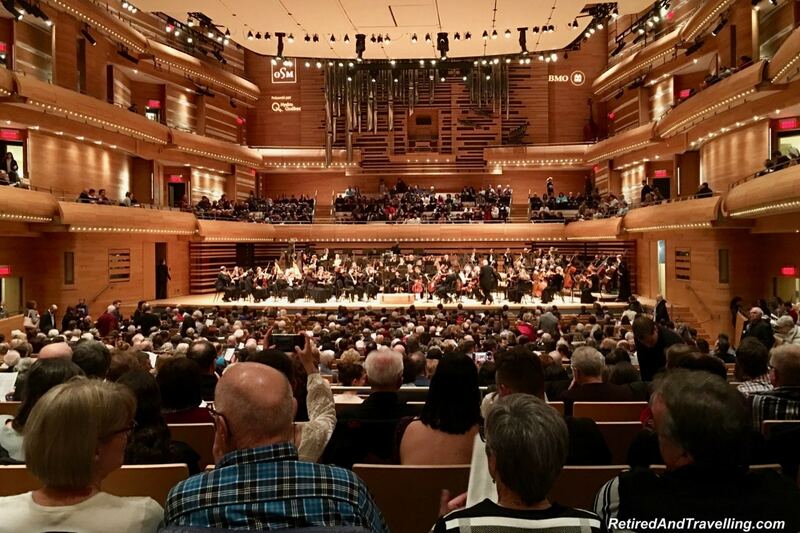 The hotel had tickets for the Montreal Symphony and they offered them to us for the Saturday night. During the first part of the evening, we were entertained by the fantastic piano work of Andre Lefevre. After intermission, the tone settled down and drew us into the music. It was a great night out. The frigid cold kept us close to the hotel on most days. But the weather was a bit better each day. 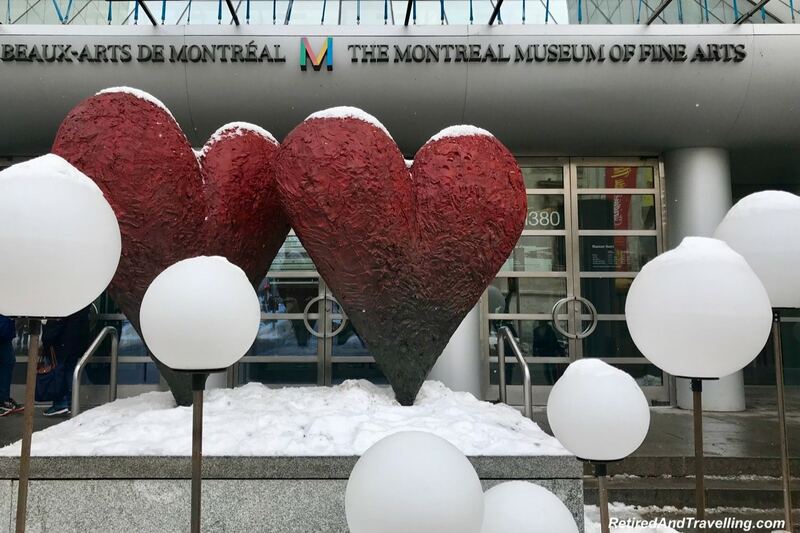 As we wandered the streets around the Ritz-Carlton Montreal we found there was lots to do in the immediate neighbourhood. 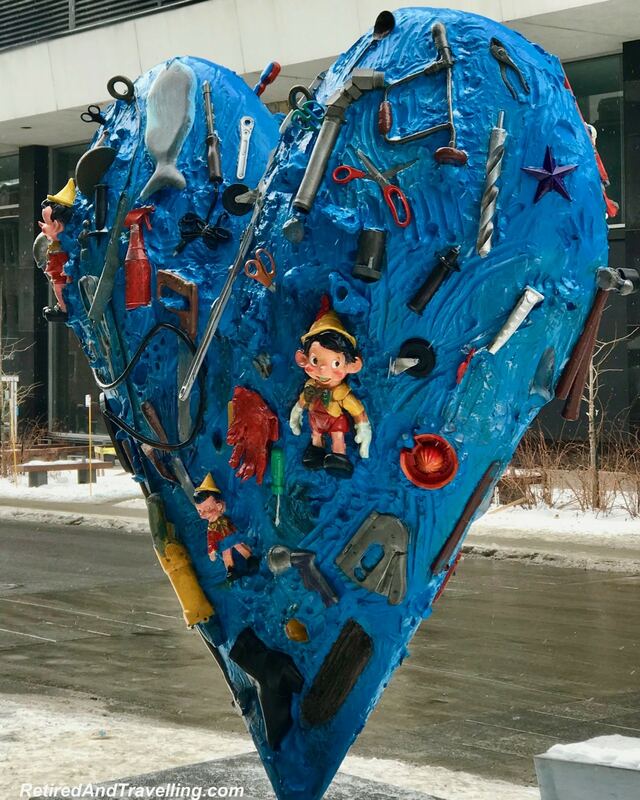 And everywhere we walked we found the interesting art in the streets that Montreal is known for. 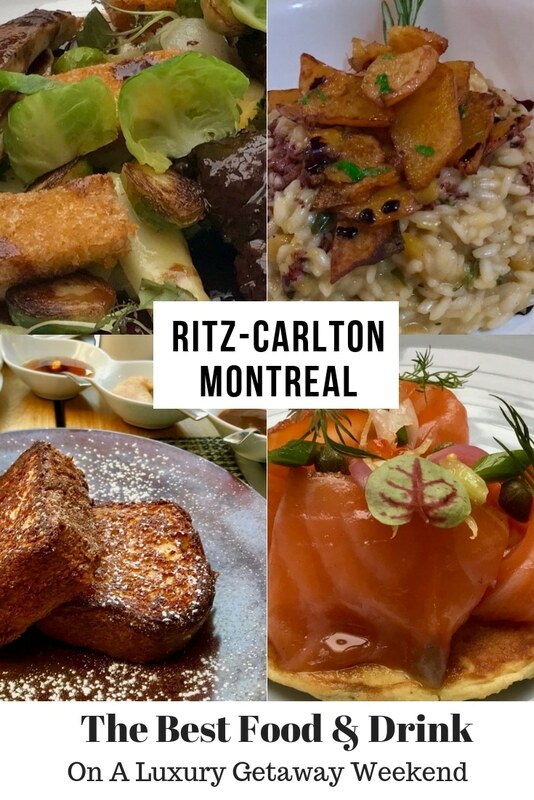 We thoroughly enjoyed staying close to the hotel on our luxury getaway at Ritz-Carlton Montreal. 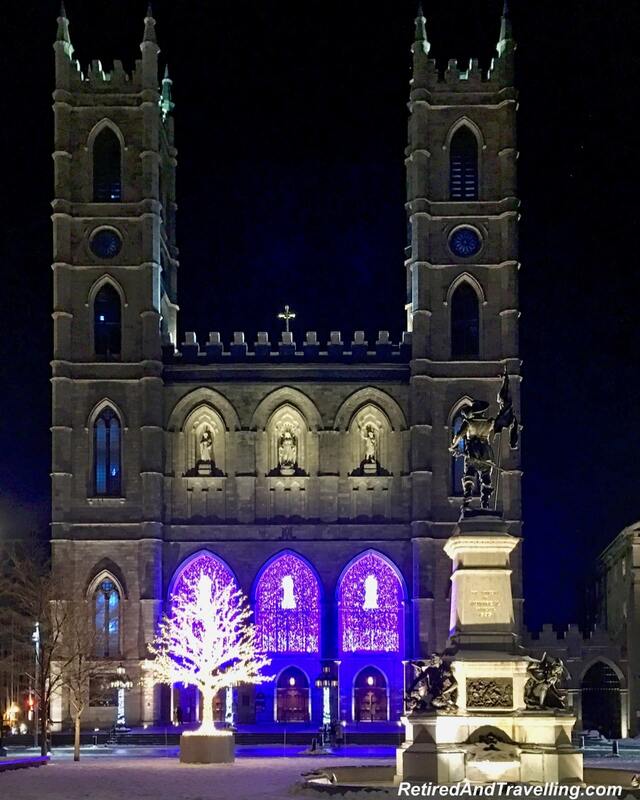 But we were reminded that there is so much to see and do on a visit to Montreal. Definitely a great reason to bring us back to this city. 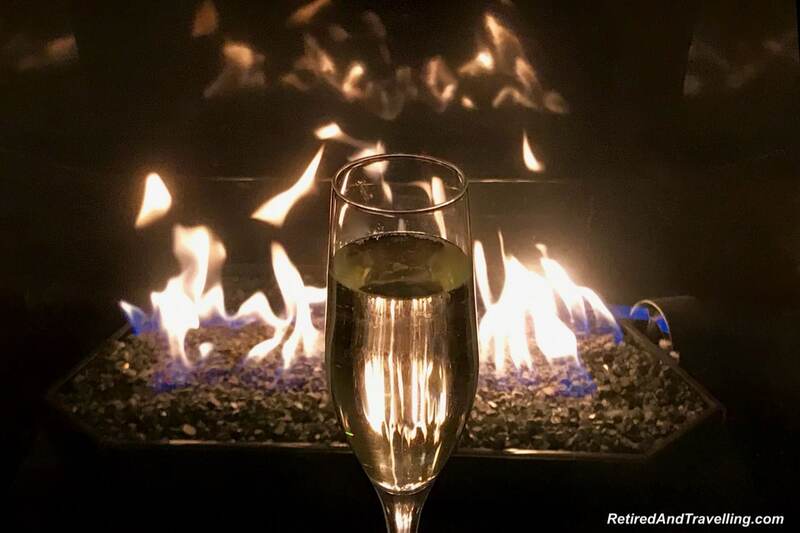 We had such a fantastic luxury getaway at Ritz-Carlton Montreal. David was certainly spoiled for his birthday. Every interaction at the hotel showed us the gold standard in customer service that the Ritz-Carlton is known for. We certainly got a world class experience on our visit. We ate and drank our way through 5 days. 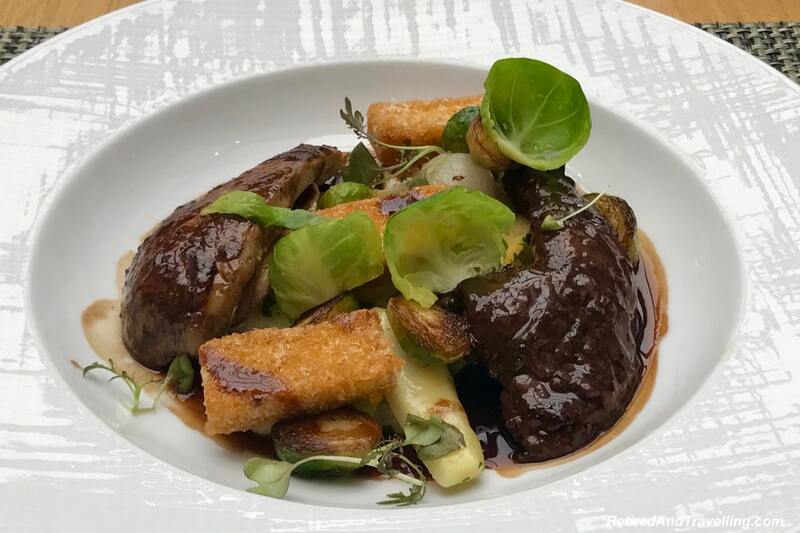 Every meal we had at Maison Boulud was a culinary delight. 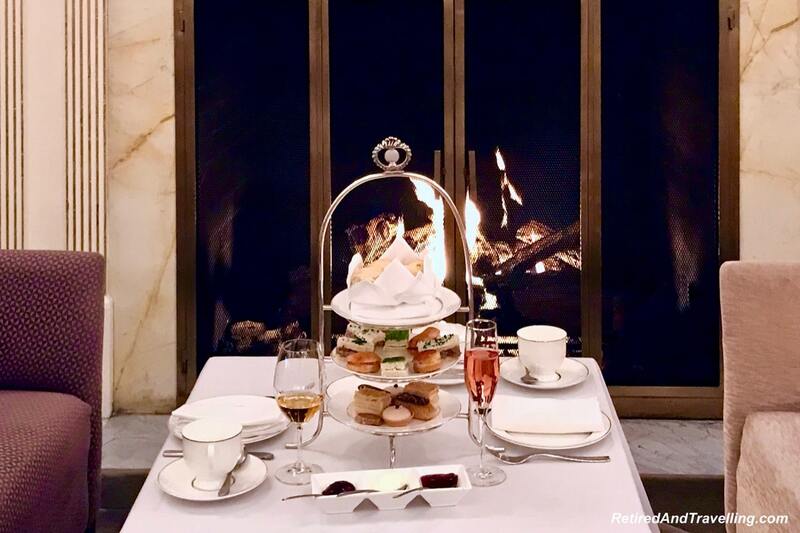 Afternoon tea at the Ritz-Carlton Montreal was a final luxury splurge. And when we headed out in Montreal to eat, we found more delicious treats. 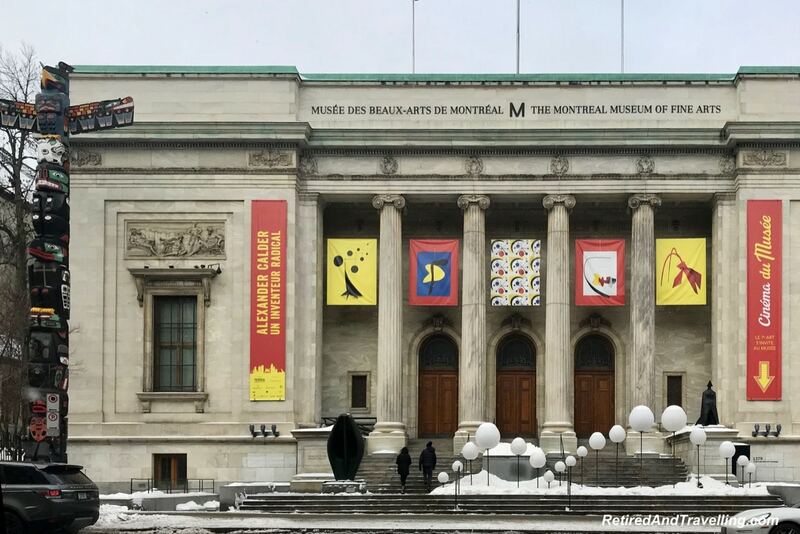 There is so much to see and do in Montreal. 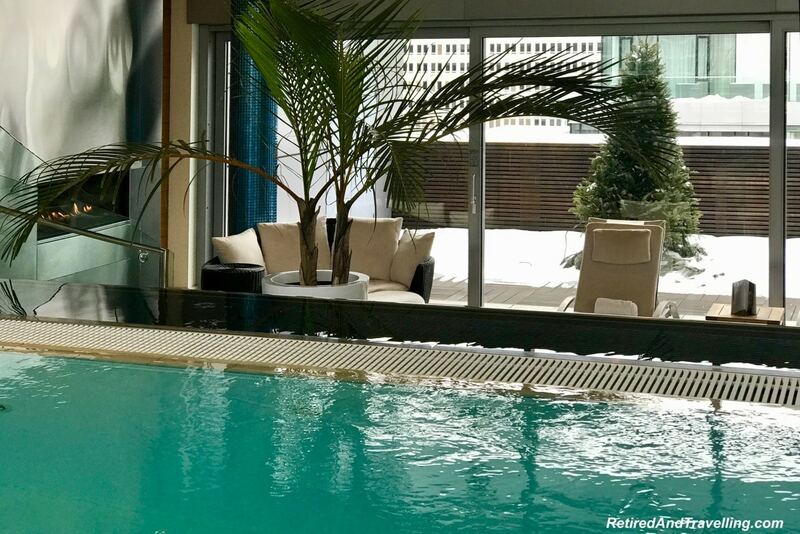 We stayed close to the hotel on this luxury getaway at Ritz-Carlton Montreal. But we will definitely be back! 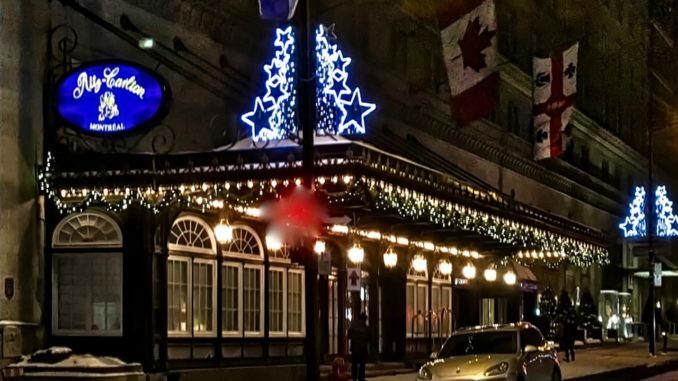 Have you enjoyed a luxury getaway at the Ritz-Carlton Montreal? What was your favourite part? Do you have another spot for a perfect splurge weekend? Notice: Our stay at the Ritz-Carlton in Montreal was paid for entirely by us. Certainly during our stay at the Ritz-Carlton Montreal, we received special perks based on our Marriott Rewards Platinum Premier Elite status and treats to celebrate David’s birthday. It would be silly to say that the wonderful treatment we received at the Ritz-Carlton Montreal did not influence our opinions. But that experience is part of the Gold Standard the Ritz delivers. And the comments and opinions expressed in this post truly represent the delight we felt during the entire weekend. I love the Ritz hotels but haven’t stayed in one. Your post doesn’t disappoint. Montreal sounds so sophisticated and beautiful. I know the regret of missing a spa because there’s so much to see and do at a destination but t’ant pis! Oh wow the food looks absolutely amazing at the Ritz. What a great luxury weekend getaway. What a great treat for you guys. Wow! This is a new definition of luxury! 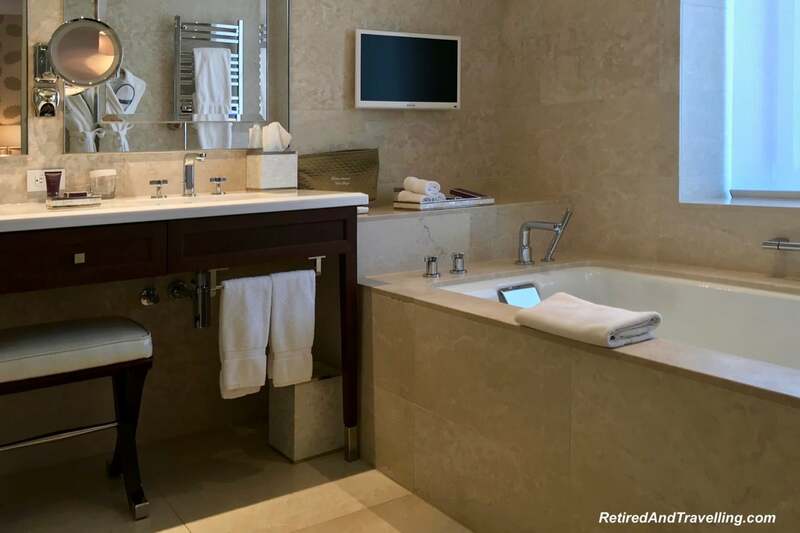 The room, amenities, food, service, and all the tiny details – I wouldn’t expect less from Ritz Carlton property!! 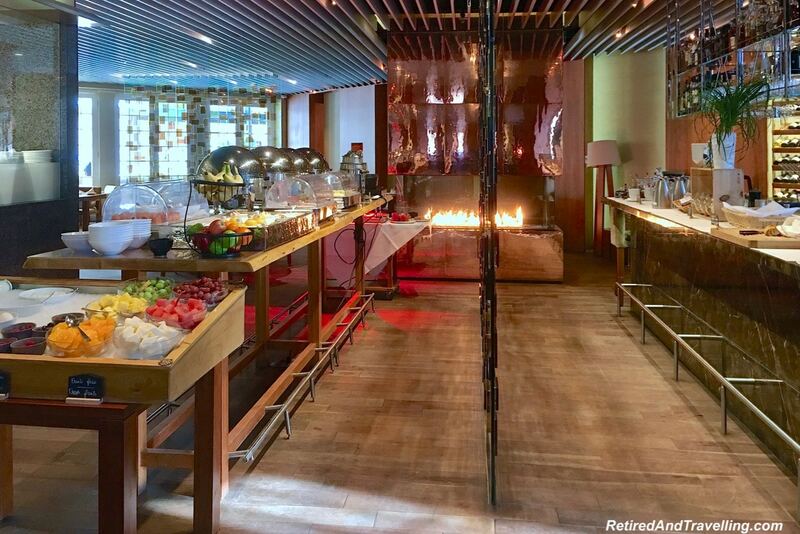 Seriously, your Marriott Rewards status is a goal! Don’t know if I’d reach that level. Anyway, belated Happy birthday to David. Cheers. 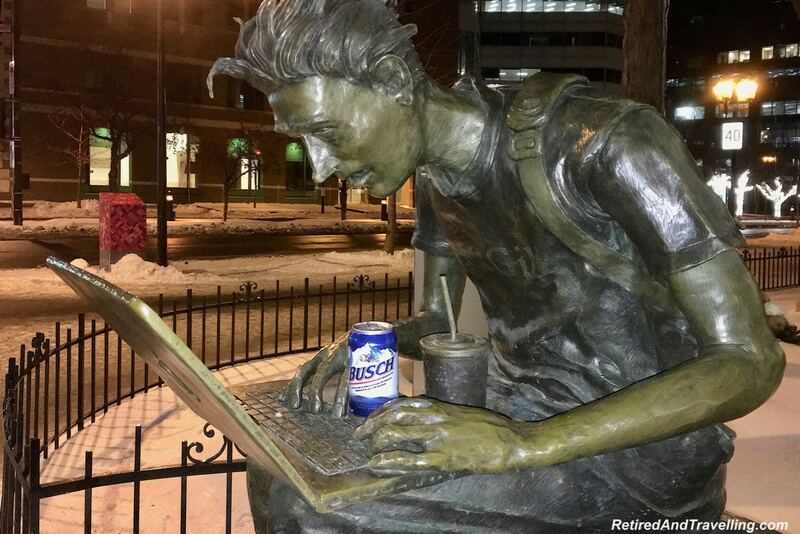 What an excellent weekend you had. I’ve stayed in a few really nice hotels, but none like this one. And all that amazing food. The chocolate dome dessert looks so good. (I’m a chocolate fan for sure.) If we’re ever in that area, I will have to to book a couple nights there. Apparently on someone’s birthday because it looks like they like to spoil people. Ritz Carlton is a popular chain, experienced their hospitality some time back. But it was no where close to this.Love to indulge in luxury once in a while. So this definitely would be my choice if I am in Montreal. 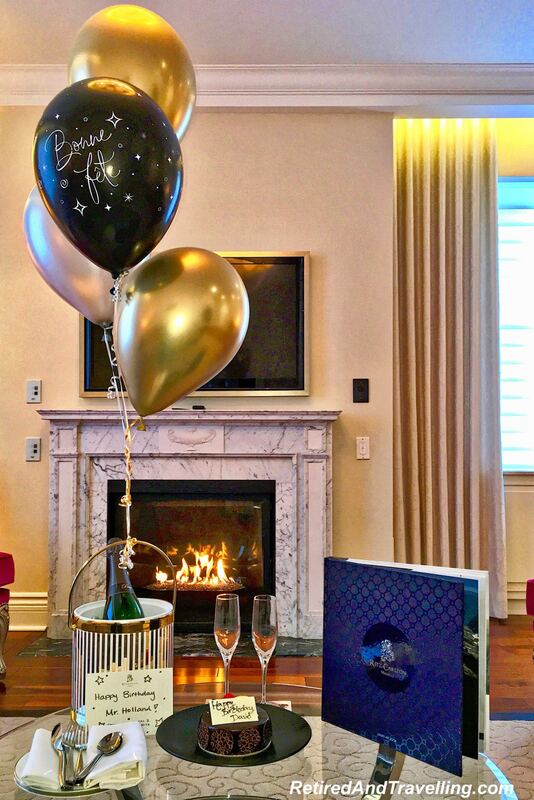 Oh wow, it looks like you had an amazing time at Ritz Carlton in Montreal. Your room looked amazing, and the food!!! Droolworthy! Wow this looks amazing in all ways! Especially love all the food photos! Looks like an amazing experience. Love the positive, but still honest review, really gives a feeling for the hotel, but also the trip as a whole. Nice! 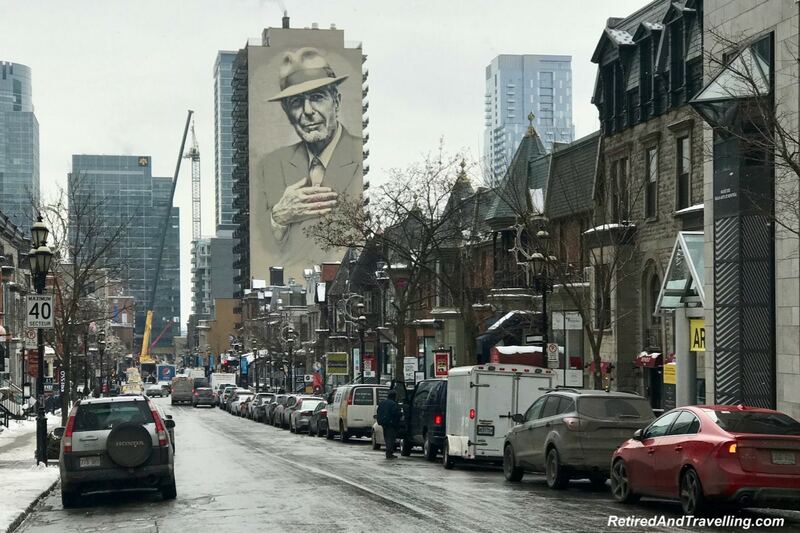 My husband is in Montreal right now! We plan to go back together one summer and this hotel looks like a great option for us! I love the old historic buildings in Montreal, and so interesting that this was the very first Ritz in the world!! Thanks for sharing this place! Today is my birthday and I have stumbled on this post. Maybe it is a sign that I should treat myself with a luxury gateway soon. I have never stayed in a Ritz-Carlton hotel and would definitely like to experience it. Happy belated birthday to David! 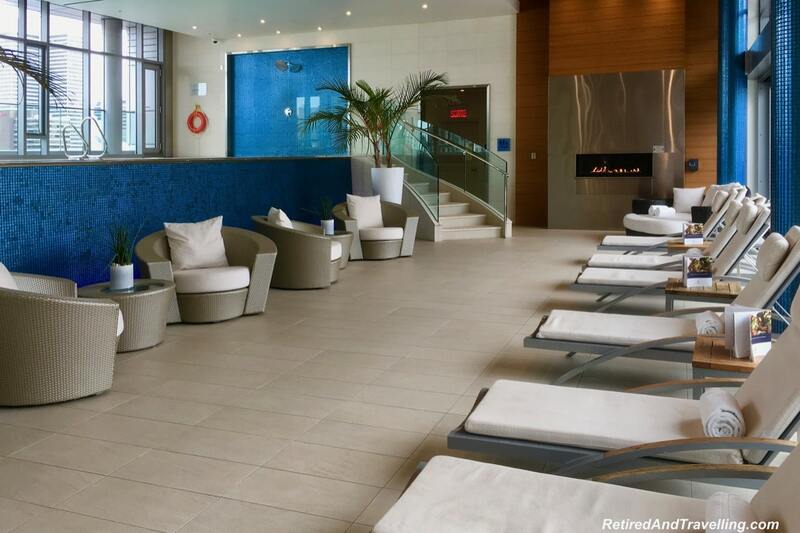 It looks like the Ritz-Carlton Montreal has perfected luxury. I could definitely handle some time relaxing and rejuvenating in the St. James Spa. Plus the spread on the buffet is calling to me. I haven’t stayed in any Ritz Carlton all over the world. I feel like hotels like this are not welcoming and are very expensive! Looks like a great way to “splurge” for a weekend, especially if it’s your birthday! Happy happy birthday, David! I’m sure you had a blast!